Define your space with this stunning bespoke rug by Behruz Studio. The plush pile, chevron pattern and luxe colour palette combine to make this a truly magnificent and unique carpet. DC Stylist: A glamorous statement rug especially great with black or brown leather furniture. Add red as an accent colour. DC Collector: Behruz Studio has been at the top of Melbourne’s rug and textile industry for over 25 years. The high quality is evidenced by the sheer weight and softness of this carpet. 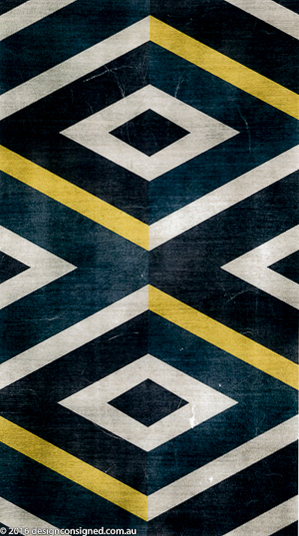 DC Insider: A Melbourne interior designer commissioned Behruz Studio to produce this carpet. Four years in the owners formal living room finds this rug still in excellent condition. Less than half the price of a new Behruz rug of similar dimensions.